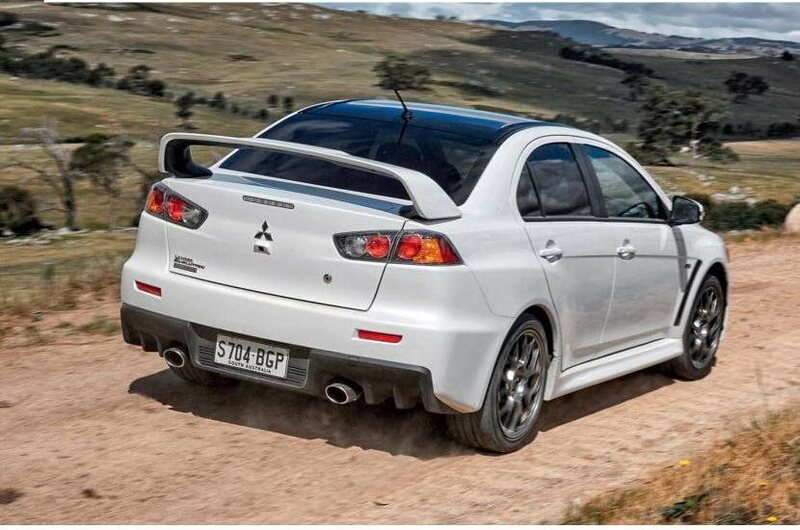 The final review of any long-standing iconic model is traditionally filled with the shedding of tears, waving of hankies and screeching of teeny, tiny violins, but things are a little different where the Mitsubishi Lancer Evolution is concerned. When it comes to the Final Edition of Mitsubishi’s rally rocket, we’re angry. Angry this revered model line has been allowed to wither on the vine with minimal investment, when at its core there is still a brilliant driver’s car lurking within, capable of feats few other machines can match, and virtually nothing at the price point. Changes to the Final Edition have been few, mostly concentrated under the bonnet. Sodium-filled valves improve heat dissipation and liberate nine more kilowatts – now 226kW at 6500rpm – from the 2.0-litre turbocharged four-cylinder, however more significant are the extra 48Nm, the 4B11T engine now punching out 414Nm at 3500rpm. The numbers are similar to its T younger competitors – think VW Golf R, Renault Sport Megane – however the experience is very different. There’s old school turbo lag here; taking off from standstill requires a hefty dose of throttle to avoid being left behind by pedestrians, but it’s important to ease off the accelerator as boost builds lest you be thrown into the car in front, body-surfing a monstrous wave of mid-range torque. Unfortunately, though the engine is effective, it’s not particularly pleasant. It feels strained and industrial at high rpm and slurps through 98RON at a ferocious rate under hard use, a characteristic not helped by having a tiny 55-litre fuel tank and only five short ratios to choose from. 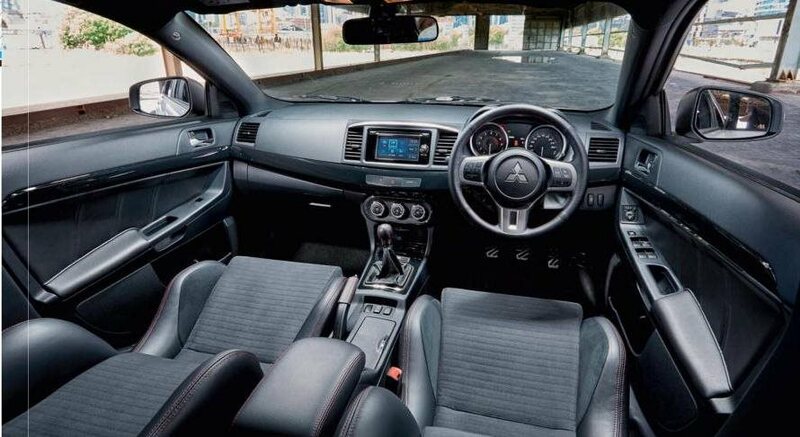 Mitsubishi hobbled the manual Evo X to encourage buyers to adopt its flash SST dual-clutch – how else to explain the retrograde step from the Evo IX’s six-speed ’box? – but with the paddle-shift not available for the Final Edition you’re left with a notchy shift and not enough cogs. It quickly becomes clear, however, that the competent but uninspiring drivetrain simply exists to transport the Evo X from one corner to the next. Few cars feel as biddable, or imbue the driver with such immediate confidence when driven quickly. Before long you feel like you can do anything with this car; the Evo X is like your best friend, always happy to get you into trouble but right by your side to get you back out again. The steering is like a driving simulator in its weighting and feedback, however it’s accurate and only really used to point the car into the corner. From there the brakes and throttle can be used to adjust the car’s attitude at will. Bilstein dampers and Eibach springs provide a jittery ride but the payoff is ruthlessly effective body control. Despite this firmness the Final Edition is beautifully adjustable. Trail the brakes in or lift the throttle sharply and the nose bites into the tarmac, shifting the rear wide at the same time. The tricky Super AYC diffs will step in to keep things getting too out of hand – even with ESP supposedly disengaged – however hold the ESP button down and “AYC Brake Off” appears, allowing you to experience this rally weapon as Mitsubishi intended. Thanks to the Evo’s clever electronically-controlled differentials, there’s a third cornering option not available to front-drive or Haldexequipped all-paw rivals: keep your right foot in, ride out any understeer and you’ll leave corners in a beautiful four-wheel drift with perhaps a hint of oversteer. Nissan GT-R owners will know the sensation well. The experience only improves when you leave the black stuff. We don’t make a habit of testing cars on gravel but as the Evo made its name in the rough-and-tumble world of rallying it only seems right to head into the forest. Unsurprisingly for a car that is still essentially a homologation special, it feels utterly at home slithering from corner to corner with plumes of dust billowing in its wake. Unfortunately, the Final Edition’s case comes apart slightly when you’re not driving like Tommi Makinen. At $53,700, it seems like reasonable value when you consider the Evo X has at times cost up to $75,000 – especially when you consider the extra power and its limited-to-150-units status – however as you might expect from a car that made its debut in 2008, it’s found wanting in a few areas. Build quality ranges from average to appalling; the doors close with a rattle rather than a thunk, the trim (the sun visors, for instance) feels thin and cheap and our test car arrived with the driver’s seat backrest adjuster sitting in the back seat (though it was easily reattached). There is no sat-nav, nor telescopic steering wheel adjust, the driver sits too high and while there’s apparently a USB input, I couldn’t find it. There’s moments of magic in the driving experience, but mostly the Lancer Evo X just feels old and in need of replacement. And therein lies the rub: it’s not going to be replaced. The potential still exists for the Evo to be a benchmark performance car, capable of taking on the Golf R and forthcoming Focus RS, but sadly it feels like Mitsubishi gave up on the model some time ago.